The 5th edition of Northern Manhattan Arts Alliance (NoMAA)’s public art initiative. Inspired by W. E. B. 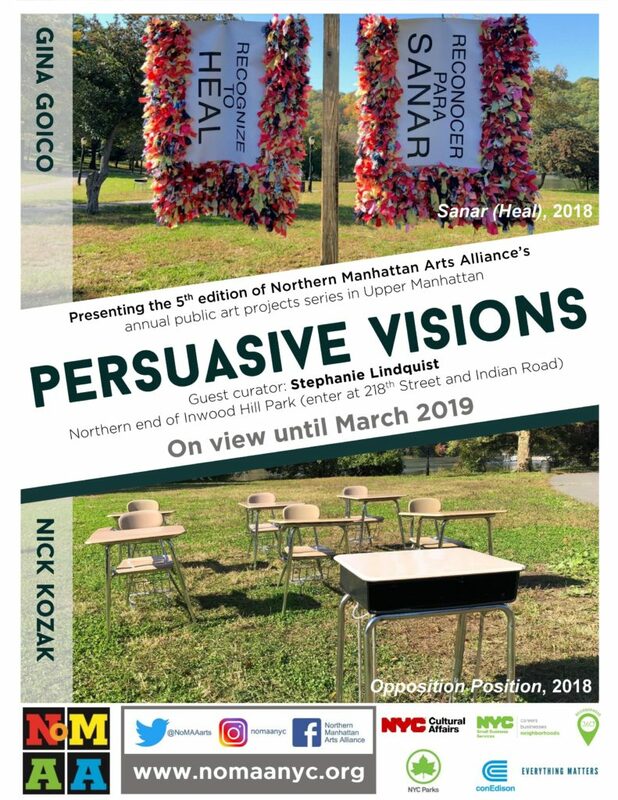 Du Bois’s conviction that propaganda through the arts can create social change, Persuasive Visions presents the work of two local artists, Gina Goico and Nick Kozak, who respond to today’s constant deluge of (mis)information. As we are inundated daily with media Gina Goico reminds us of the power of cleansing ourselves and holding space for our community. In this case, she invited neighbors to reconnect through conversation and collaboration creating traditional Dominican pellizas that read “reconocer para sanar”/ “recognize to heal” in her installation Sanar. Nick Kozak’s installation Opposition Position challenges us to examine our education system and to stage our own educational interactions in this classroom in the park. This holiday season we were shocked to find the social sculpture Opposition Position uprooted in Inwood Hill Park. Created by artist Nick Kozak, this public art work is activated by local high school students every month through dialogue around topics that matter most to youth and the community: health, safety, education, communication, technology, and identity. In the days after we were also heartened to see neighbors take ownership of this social sculpture by carefully arranging the chairs and desk of this classroom in the park back to its original layout.